On 11/11/11 Feed The Hood / Feed The People and Fill Your Fridge were born. Since that time truthfully we have lost track of exactly how much food we have distributed and how many people we have served but I can tell you in all truth we have distributed over 3 tons of food and fed over 2000 people. Sometimes the food we get is donated from companies with a conscience like Trader Joe’s other times we work with local organizations like Fair Foods purchasing $2 bags of groceries from individual donations from the community. We haven’t posted any videos in a while but here’s a shot from last Saturday’s effort. 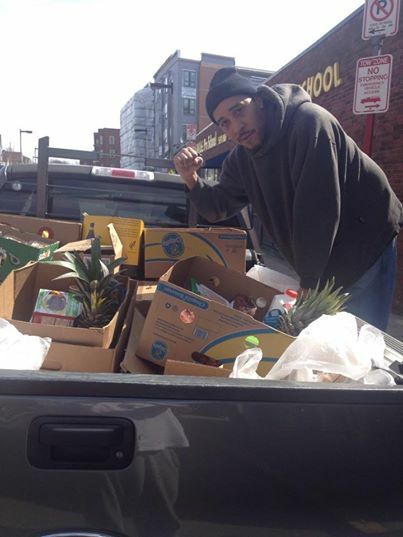 Every Saturday we Feed The Hood, Feed The People & Fill Your Fridge!! Shout out to Blackstonian Family JD Nelson for the use of the Truck and my Barber Allah who took the photo!